In the Indian smartphone market, the competition in the mid-budget segment is fierce and it takes a lot for any new product to stand out. This might be one of the primary reasons why OPPO has decided to bring an all-new K series to the country. Dubbed the OPPO K1, it’s the most affordable handset with an under-display fingerprint scanner. However, does the K1 pack in enough to entice the budget buyer or the company is solely depending on the novelty factor? We might be able to answer these questions better after a full review but for now, we are here to share our initial impressions of the phone. Admittedly, we have come a long way in the design department in the last few years. There was a time when every other phone in this segment came with the same boring design and a plastic back cover. But that’s not the case anymore as we’re seeing high-end aesthetics in the mid-range handsets, and the OPPO K1 also continues the same ideology. The phone comes with a glossy back with a gradient pattern, which looks more appealing in the case of the Astral Blue model. While the phone looks quite premium, it catches fingerprints rather easily. The OPPO K1 is also easy to use single-handedly, but feels slippery in hand, which is why we’d recommend you to use a protective cover. The volume buttons are placed on the left spine and the right side holds the power key. We found the buttons to be easily accessible during our time with the phone. The back of the phone, especially the design and placement of the dual-camera module will remind you of the OPPO F9 Pro (review). The loudspeaker grille, a 3.5mm headphone socket, and the micro-USB charging slot are all present on the bottom. Without wasting any time, let’s talk about the display. 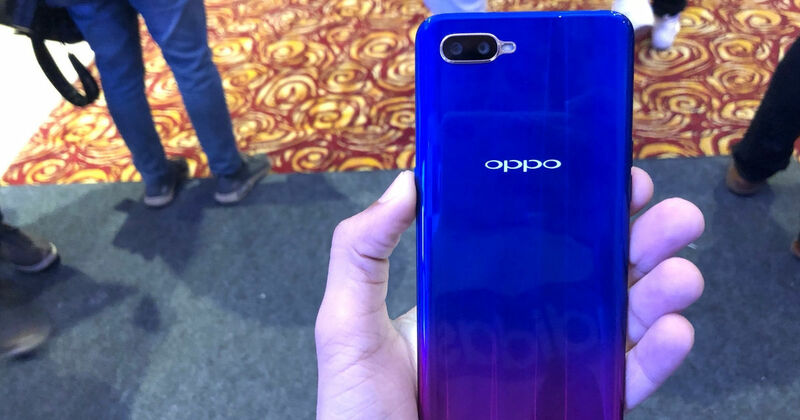 There aren’t many phones under Rs 20,000 that feature AMOLED panels but OPPO K1 belongs to this rare breed. Also, in the case you are wondering, there’s a good reason why OPPO has opted for this display tech. As mentioned above, the handset comes with an under-display fingerprint reader, which only works on AMOLED panels as of now. In our brief time with the phone, we found the in-display fingerprint sensor to work flawlessly and there was no delay of any kind either. To offer a full-screen experience, the company has opted for a 6.4-inch panel with a waterdrop notch design, similar to the one on the OnePlus 6T (review). In our testing, we found the display to be vibrant and crisp. The phone should remain usable in outdoor conditions as well, considering the maximum brightness level observed indoors. Under the hood, the OPPO K1 is powered by the Snapdragon 660 AIE SoC, coupled with 4GB RAM and 64GB storage. On the software side of things, the phone runs the company’s proprietary ColorOS 5.2 platform, which is based on Android 8.1 Oreo. During our brief usage, we did not face any stutter or lag issues. We’ll surely put the phone through its paces to tell you about its performance in the detailed review. Jumping to the optics, the handset comes with rear-facing dual cameras, consisting of a 16MP shooter and a 2MP secondary sensor. At the front, you get a 25MP AI-capable snapper. Notably, the rear camera setup allows for portrait shots, but the selfie snapper for some reason doesn’t offer the software-based bokeh effect. On paper, the camera specs do look impressive, but we’d reserve our judgment on the camera performance till we spend more time with the OPPO K1. The smartphone houses a 3,600mAh battery that should likely last a full day of regular use. The OPPO K1 has been priced at Rs 16,990 and will be made available for purchase via Flipkart from February 12th. While the handset features some interesting features, it’ll face solid competition from the likes of the Realme 2 Pro (review) and the Xiaomi Mi A2 (review). Stay tuned for the full review to see how OPPO’s latest stacks up against the competition.